« Fly south for the winter? 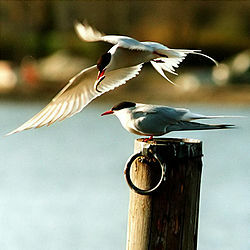 The Guinness Book of World Records credits the Arctic Tern with the longest migration. Breeding on the tundra north of the Arctic Circle, this gull-like bird, flies south to Antarctica (it is summer down there), a distance of 12,000 miles. In spring, it returns to the Arctic. That is over 24,000 miles round trip every year. Calling the southbound trip “fall migration” is something of a misnomer. Because of the early onset of winter weather that far north, the Arctic Term actually begins heading south in July. And doesn’t arrive on the wintering grounds until September.